In particular, they are promoting two new products - payday loans secured against a salary or logbook loans secured against a car, it says. The charity has made a complaint to the Office of Fair Trading. Credit Action says many of the adverts contravene UK credit advertising regulations, usually by failing to give details of interest rates. 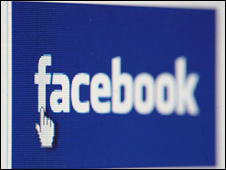 It is now advising Facebook users to warn the website about adverts which break the rules. A charity spokesman said: "Social networking sites, Facebook in particular, have become hugely popular in recent times, and not just with users. "Lots of credit companies, especially payday and logbook loans companies, are using the medium to advertise their products. "It is such a popular method because they can target young people with whom the site is so popular." Chairman of Credit Action's board of trustees, Malcolm Hurlston, said that advertising rules "are there for a reason". He added: "They are there to make it clear to people from the beginning what they are letting themselves in for." Mr Hurlston also said some adverts do include the rates of APR but only in the frequently asked questions section, and not prominently on the advert, which is what the rules require. BBC technology correspondent Rory Cellan-Jones says the adverts are being placed at a time when it has become harder to borrow from traditional sources. It has an estimated 50 million members worldwide and figures released earlier this year suggest that it has 8.5 million UK-based users. I saw an advert for Payday UK and attempted to go through their application form. Once I had completed all of the required fields it asked me to enter an authorisation code that was sent by SMS. This code did not arrive and when I queried this with the helpline I got the answer that I needed to send a copy of my passport to them despite it being all over the site that no documentation was needed. At this point I got cold feet and asked them to remove my details as I was not going to complete the process. To this I was told they are legally oblidged to keep my account details (bank & debit card) on file for 6 years. I am not happy and am trying to ascertain whether this is legal or not. I recently complained to the FSA regarding PayDay UK, who offer loans at 1355% APR. It seems unreal. On their website they also provide information about what apr means - but this is totally misleading. They compare borrowing money over a 3 or 5 year period with their charges for one month, and suggest that their rates are cheaper! The FSA's response was: "Neither the FSA nor the OFT can intervene in or investigate complaints against firms on behalf of the public...To make a complaint against the firm you should complain to the firm..." I am sure that the firm, PayDay UK, are fully aware that they are targeting young people who have no knowledge or understanding of finances. I am also sure that the firm feels no remorse for preying on the vulnerabilities of their victims. Evidently, all PayDay UK obviously care about is money. What then is the point of making a complaint to them, and detailing the above? I suspect their response might be something like: "Dear Damian, thank you for your compliments! If you would like to arrange a loan with us we would be more than happy to prey on you too!" I strongly feel that there should be laws implemented to prevent these kinds of companies operating. I also feel that Facebook should be ashamed of making money by allowing these companies to advertise on their site. I think it is wrong, there are so many people preparing to go to uni at this time of year, and they may think, well if i get a loan i will be able to afford it. Its wrong and i feel personally that it is taking advantage of the younger generations. I saw an advert where you can take out a loan as little as £70 to bout £2000. I was tempted to borrow jus £100 as I was skint that week and you can't really borrow small amounts of money like that anywhere else. I don't think it's a good idea. I just saw it and wanted it because I could. I noticed an advert for a 'payday' loan on facebook, and out of curiosity I clicked on it to find out what it was - i was shocked by how misleading the marketing of the loan was; it was cleverly done and could easily dupe vulnerable or naive individuals. The value of the loans is low and it just seems like a completely pointless product, but I was left stunned when i discovered the APR breakdown: a whopping 1380%. That's no typo! Facebook is responsive to user suggestions and complaints. I was offended by a particular set of ads for "meet the babe of your dreams" and emailed them; the ads stopped appearing on my profile within hours. I am sure that Facebook will respond equally well to Credit Action's complaint. This highlights a wider issue over US adverts appearing in a UK context, something the technology should be able to solve if done right. I find using Firefox and AdBlock you can set it so that you don't see the ads. Parents could set it up if they wanted so kids didn't see them at all. You should be aware of the fact that not all Facebook users are "Young People". Personally, I'm 54 and quite a lot of my friends of similar age use it to stay in touch. These ads don't bother me, they're just part of the background noise of using the net. After all, someone has to pay for the upkeep of the system and I'd rather it was advertisers than me. Have we lost all power of free will? There's nobody pointing a gun to your head threatening to pull the trigger if you don't click on one of these ads and take up the loan they advertise! You can click on it, see the interest rate is humongous and close the page - or not click on it at all if you can't afford credit, simple as that. I've seen the ads, I should think most people have. I didn't think they were illegal and if they are they should be removed. However, I can't help thinking, if you are silly enough to take one of these loans when they are so obviously an unregulated scam.... you deserve the obvious outcome! I use Facebook and have certainly noticed the advertising boom since its early days. The ads are often targeted, as keywords on your profile are used, but also often not at all and are just general. Sometimes they are actually useful; I'm a gamer and sometimes good offers come up. Other times it's things like these debt ads. I had noticed the payday loans and do think it's disgusting that this kind of ad is allowed when users are generally of a young age and we're mostly in debt from University anyway! !